During the last few years I have come to specialise in bespoke stationery; save the dates, wedding invitations, RSVPs, maps, seating plans, orders of service, menus, thank you cards, and anything you may need for your special event. I take great passion in what I do and I pride myself on my loving approach to each project. I focus on creating unforgettable stationery for your special day that no one else in the world will have! You may have tons of ideas or you may not know where to start. Whichever the case I am here to help! Simply pop me an email to hello@luciasoto.com, you might include a description of your idea, colours, typestyles, reference images and inspiration of any kind or you might just introduce yourselves and I will take care of asking the relevant questions to build an idea together. You can fully personalise your stationery with your own wording; venue location, ceremony information, guests names, poems, quotes, etc. Once we have built an idea and collected all your details, I will work on a first draft for you. This is a rough sketch to outline the illustrations and general layout of your stationery. You can review and make changes over this initial draft and only when you are absolutely happy with it I will move on to painting, inking and lettering the final version of your piece(s). Since my clients are all around the world I don't usually deliver the printed pieces, instead I deliver hi-res print-ready digital files with instructions for you to produce at your local printers and I will advise you on how to produce your pieces; printing, papers, finishings, envelopes, etc. However, if you are in London, I can also take care of arranging the printing and delivering of your stationery to your door. Depending on the scope of the project, lead times are usually around two to three weeks for bespoke invitations and stationery. 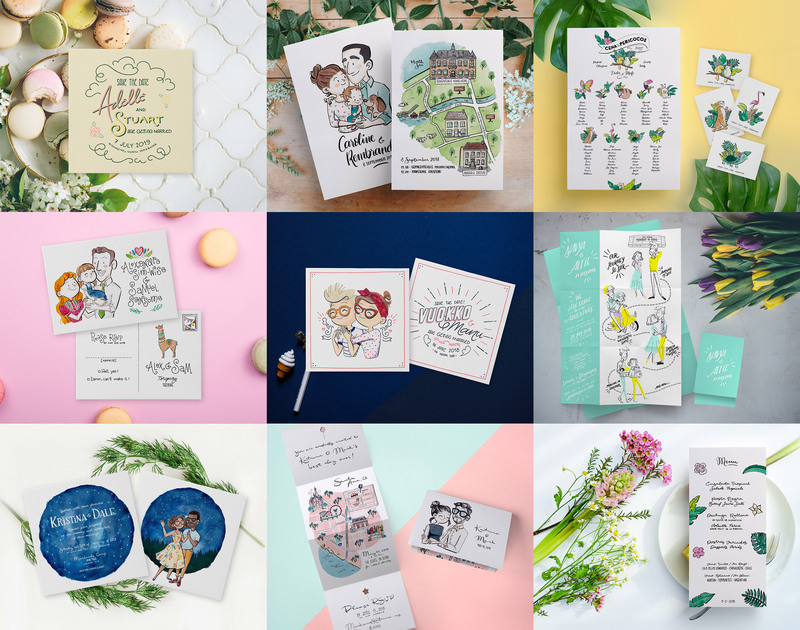 I give my best attention to each project and I personally draw every piece, this means I can only take a limited number of bespoke stationery jobs and sometimes there might be a waiting time. Please do enquire in advance to avoid disappointment. Prices vary according to the scope of the project as I base my fees on the amount of work each piece require and therefore the number of hours I will devote to complete it. Once we have discussed the details of your project I will provide you with a full quote for the totality of the job. I use a simple agreement based on the standard terms and conditions provided by the Association of Illustrators in which we outline the conditions of the project; timeline, fees, and any other relevant details. On acceptance of the agreement, a 50% deposit is required to secure the booking, the remaining 50% balance will be due on delivery. Please do feel free to email me with any queries you may have – I would love to hear from you!